Streams flowing into the White River in Independence County include Flaherty Creek, Poke Bayou, Wolf Bayou, Greenbriar Creek and Salado Creek. On the divide between the Strawberry River and White River, Poke Bayou begins. Its watershed waters flow southward, entering the White River at Batesville (originally named Poke Bayou). The first settlements of the historic city were on the banks of Poke Bayou as early as 1800. Records of one mercantile establishment are dated 1812. In the last four and a half miles segment in the city of Batesville, Poke Bayou winds lazily though rolling hills and hardwood lined banks with occasional riffles preceding the bends. 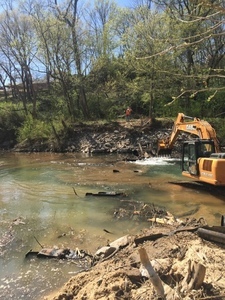 It passes adjacent to Batesville’s old downtown where canoers will soon be able to access the stream at a small water craft launch funded by the Arkansas Game and Fish Commission (AGFC) and the city. The upper access for this stretch is at the Highway 69 (White Drive) bridge near a city park. Paddlers going the entire distance may take out at the White River Bridge access one half mile downstream from the mouth of Poke Bayou. Area Boy Scouts use the last two miles to train for the 150-mile National White River Canoe Race. This Explorer Scout race, held each August, begins on the White near Bull Shoals Dam and ends at the Batesville city park at the White River bridge. Friends of the North Fork and White Rivers has been supporter of this race for many years. The use of Poke Bayou for floaters and fisherman has brought attention to the beauty of the natural surroundings along the stream. The Poke Bayou watershed encompasses 111, 800 acres in 172 square miles, including 290 miles of stream length, with an elevation change from 918 feet to 243 feet. Flowing through a rough karst landscape, the perennial stream is fed by numerous springs. Caves, fissures, and sinkholes are common in this watershed. Karst terrestrial and aquatic species are located here, as well as cave crayfish species. Smallmouth bass, largemouth bass, Ozark bass, rock bass and bluegill are commonly found. Bluffs 200 to 400 feet line Poke Bayou above Batesville, where it’s upper waters have mostly class I and II rapids, with an occasional class III rapid. 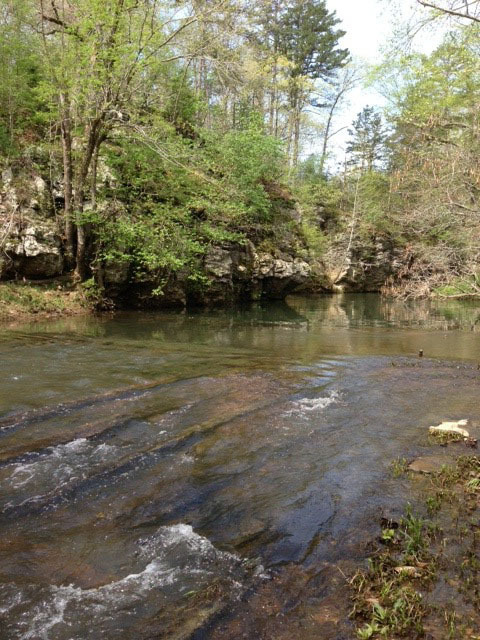 Poke Bayou cuts through St. Clair and Izard limestone formations and often exposes Batesville and St. Peter sandstone layers. From the late 1800’s until the early 1960’s, manganese mining became a large industry in the watershed. The high-grade ore found here was used in the manufacture of steel. Ruins of wash mills and mine shafts dot the hills and tributaries today. 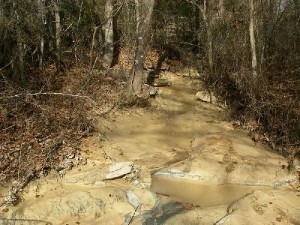 The water of Poke Bayou at Batesville often was red with clay discharged from the ore washing during this time. While the majority of the watershed is forested, urbanization and agricultural industry pressure have recently become threats to the normally high Poke Bayou water quality. County gravel roads comprise at least 50% of road miles in the watershed. Poultry and cattle farms are increasing in number. Two poultry processing plants in Batesville process a total of 3.5 million chickens weekly. Understandably, excessive sediment and nutrients from animal waste are now a significant source of water degradation. Polk (or Poke) Bayou feeds into the magnificent White River and is one of the Batesville area’s most historically important waterways. Aside from its prominent role in the establishment of the Batesville area, Polk Bayou has become a leading tourism draw. Polk Bayou offers visitors the chance to experience the natural beauty of the Batesville area whether it is through fishing, canoeing, kayaking or bird watching. A gentle stream flows past forests that hug the sandy shoreline. Here and there are dramatic rock formations. Birds swoop and sing; deer drink from the clean water. This isn’t some remote location. It is Polk Bayou, which meanders through Batesville to empty into the White River. For the past year and a half, the Batesville Area Chamber of Commerce has been working with the city government to make the stream easier to access and navigate. The biggest problems are two sewer pipes that cross the stream — one floater is quoted as saying, “What the bayou has is ‘flat-water paddling,’” she said. “There is not a lot of current, no rapids. Pictured here you can see the pipeline across Poke Bayou being removed. One down and still one to go. Progress is slow but steady. The city is negotiating with the railroad to replace the sewer pipelineon lower Main Street. Then they can replace the remaining pipeline across the stream. For a full listing of the area’s public access locations, vist the interactive map link at www.agfc.com/resources/Pages/ResourcesMaps.aspx. Well hidden in the middle of nowhere is a fantastic whitewater creek called Wolf Bayou, a Class II to IV stream with a steep gradient, ledge and waterfall drops, boulder garden rapids, undercut walls, swift currents, willow striners and enough excitement for all but the hairiest of whitewater boaters. This run is in Cleburne and Stone Counties near the Independence County Line, just southwest of Batesville. The Little Red River flows nearby to the south. 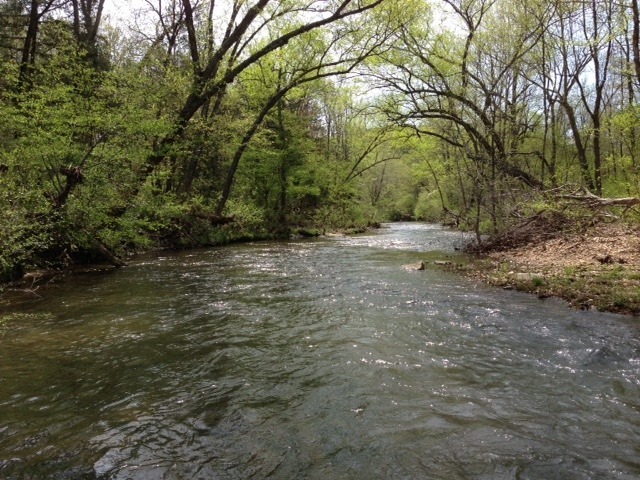 The White River, into which Wolf Bayou flows, is to the east and southeast. 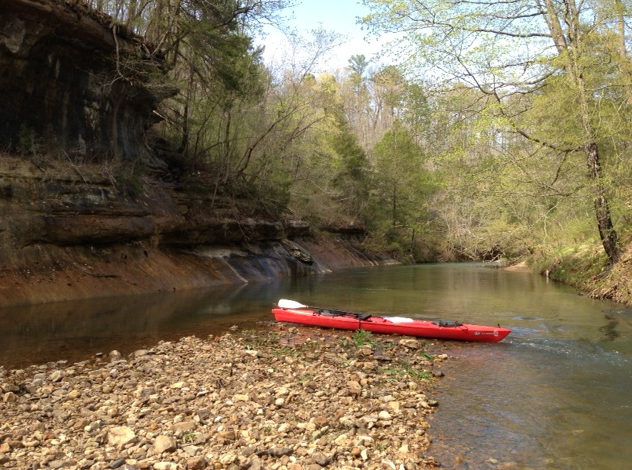 The Buffalo National River sits to the west and the Strawberry River flows just north of Wolf Bayou. Flows derive primarily from snowmelt and rainfall runoff in the Ozarks of northcentral Arkansas. Wolf Bayou features a 6.4 mile reach with most of its technical stuff within the first mile or so. Ledge drops of 4 and 8-10 feet are precursors to a 12-foot slot waterfall drop after which the river begins to settle down into a very enjoyable Class II to III+ run. This stream begins on a gradient of 110 fpm, but after the first third of a mile or so it suddenly plunges at a rate of about 165 fpm in a momentary freefall. The upper part of the run flows through a beautiful, narrow gorge that continues for over 5 miles, after which it opens up, its gradient becomes a little "flatter" and dense stands of willow trees lining the creek banks become the primary hazards to avoid. Access is via a private road that belongs to hospitable owners, so please be courteous and appreciative of their allowing you to park your vehicle and put in on their land. People hunt these parts, and anybody you encounter is liable to be armed with a rifle, pistol and/or shotgun depending upon season and their prey. Take that for what it is worth when you meet somebody in this area. As they say at the poker table, "A Smith and Wesson beats a royal flush every time!" Salado Creek is an Extraordinary Resource Water. It flows eastward and then north into the White downstream from Batesville. It is almost entirely in Independence County. It comes out of the Boston Mountains and into the delta. Salado Creek, a tributary of the White River, forms at the confluence of three smaller creeks just north of the community of Floral in Independence County, then flows southeast somewhat parallel to and north of SH 87 before turning northeast and flowing to its confluence with the White River near the Town of Salado at US Highway 167 near Jacksonport State Park and Newport. 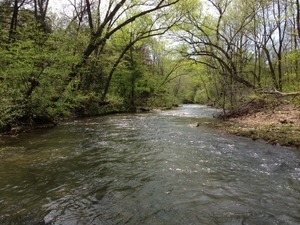 The creek flows generally parallel to and between the Little Red River to the south and the White River to the north. Salado Creek is a place of immense natural beauty. All around the creek is farmland that is effectively hidden behind dense stands of trees along the banks for most of the run. The current flows fast, clean and clear at optimum levels, and the channel will be an obstacle course of small Class I to II boulder garden-type rapids, dead-fall debris, small drops and occasional log jams. The creek is never wide (only about 10-12 feet in some places), but becomes even more constricted starting about 2 miles below Camp Tahkotah, where it enters a small canyon. Float the Salado: The popular reach is a Class I to II run of about 11 miles from Girl Scout Camp Tahkotah to the US Highway 167 bridge. In low-water conditions boating is not practical. Navigable flows are determined by the "very scientific" method of observing how many stones are visible at the take-out bridge. Nine or fewer stone means we are paddling today, but if ten or more stones are showing, then we ain't a goin'! Put-in access is on the Girl Scout camp property where a nominal fee is required to launch (fees help maintain the road to the access), and the take-out is a relatively easy one at the old US Highway 167 bridge near the Town of Salado and just above the White River confluence. The Arkansas Highway Department provides limited camping facilities at the nearby Salado Creek Rest Area on the highway just south of Salado.